This Month’s Book: Waiting Is Not Easy! Our Cover to Cover Book of the Month for December is Waiting Is Not Easy! by Mo Willems. Sometimes one of the hardest things to do is wait. Especially when surprises are anticipated. 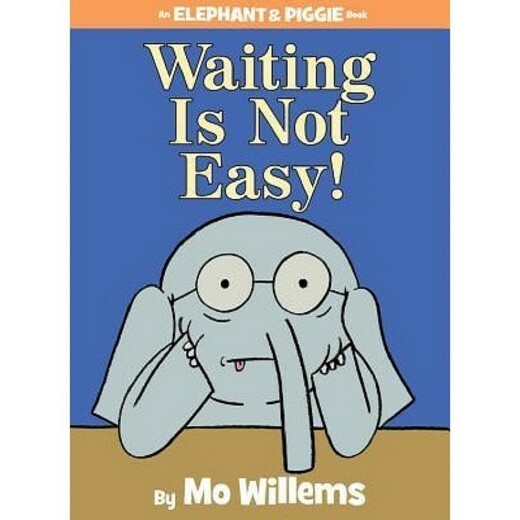 In this wonderful book, Mo Willems takes us on a journey of waiting and the beautiful surprise that follows! Waiting is NOT easy! But unfortunately, it is necessary. Fortunately, many things are worth the wait! 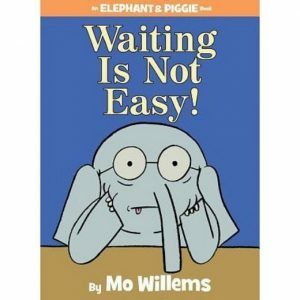 Mo Willems’s Waiting Is Not Easy depicts this scenario perfectly. While reading, talk with your child about how Gerald and Piggie each react to having to wait. Talk with your child about a time when they had to wait for something. How does it feel to wait? Explore with your child some fun waiting strategies. While reading Waiting Is Not Easy! talk to your child about what is happening on each page. See if they notice any changes taking place from page to page. Making predictions and focusing on details of the illustrations with your child will help them develop comprehension, an important early literacy skill. Waiting in offices can be so hard for children. Distract your little one from the difficulty of waiting by PLAYING! Turn counting into a game and ask your child to count how many yellow objects are in the office waiting room. Then, change up the color. Play “I Spy,” or take your baby on a stroll through the office and describe different objects. The possibilities are endless! Send a picture of you and your child playing games in the waiting room. Be creative! We can’t wait to see what you loved about Waiting Is Not Easy!